Suhaib Ilyasi in New Delhi last year. He was sentenced to life in prison this week for fatally stabbing his wife in their home in 2000. In a case that played out like an episode of his own true-crime television show, the former host and creator of “India’s Most Wanted” was sentenced this week to life in prison for murdering his wife and trying to frame it as a suicide. 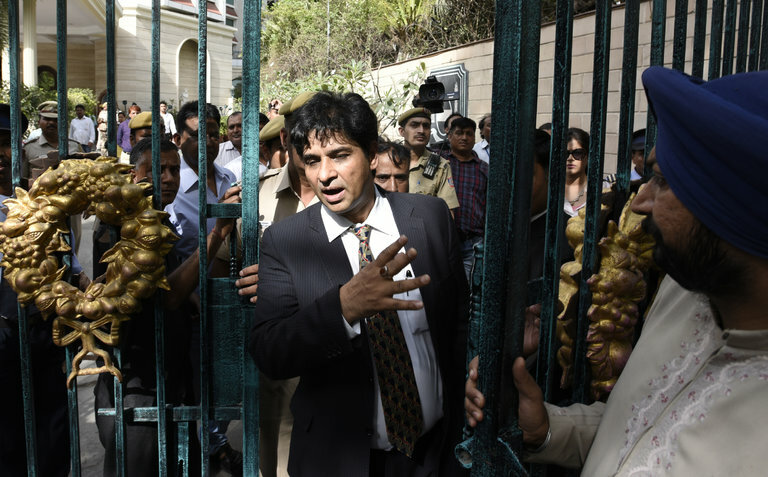 Suspicions about the host, Suhaib Ilyasi, first gripped Indian headlines in January 2000, when his wife, Anju Ilyasi, 30, was found dead from multiple stab wounds in the couple’s East Delhi home. Mr. Ilyasi, 50, has maintained that his wife killed herself after an argument. But in his ruling, Judge S. K. Malhotra said, “The record does not indicate that she committed suicide.” He suggested Mrs. Ilyasi was killed for knowing too much about her husband’s criminal past. The television host “committed her murder and gave it a color of suicide,” the judge said, according to local news reports. “Injustice!” Mr. Ilyasi shouted when the sentence was announced. Mrs. Ilyasi knew about her husband’s history of “forgeries and wrong acts, i.e., possessing two passports, using a fake degree for a job, committing credit card fraud, etc.,” the judge wrote in a 125-page verdict read in court on Wednesday.